Pushkar is a unique gem amongst the grandeur of Rajasthan. Pushkar “The Holy City” of Rajasthan is internationally known for its colorful cattle fair when thousands of devotees from all faiths assemble & take a dip in the holy Pushkar Lake. Pushkar is a vital religious place for Hindus in Rajasthan. This small city is initially famous for Pushkar Camel Fair and the Lord Brahma Temple. 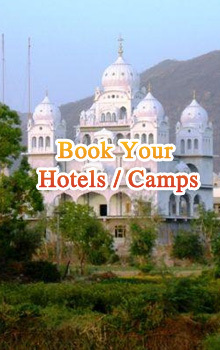 It is situated at just 11 kms from Ajmer & 150 Kms from Jaipur in Rajasthan. Pushkar has as many as 400 temples and 52 Ghats, which includes the only temple that is dedicated to Lord Brahma in India. Pushkar is a heaven for the religiously inclined. Pushkar is among the five Dhams or Pilgrimages that are held in high esteem by Hindus, the others being Badrinath, Puri, Rameswaram, Dwarka, etc. It is said that in battle lord Brahma killed the demon Vajra Nabh with a lotus flower, whose petals floated down to earth and landed in three places in and around Pushkar where lakes sprang up. The ancient town of Pushkar is transformed into a spectacular fair ground in the month of Kartik. Every November, the famous Pushkar Fair is held for 7 days, starts on Noami, finish on Kartik Poornima (Full Moon). The Fair is predominantly a gathering with thousands of camels, cattle and horses for trade, with added attractions of games, races, local folk dances, song and entertainment. Pushkar Fair is much more than the colorful display of Rajasthan's rural lifestyle, attires, performance arts, and handicrafts. The Cattle and Camel Fair at Pushkar is the largest one of its kind on the planet. Over 50,000 camels find their way to the Pushkar Fair to be traded off or display their best features, beauty and tricks - yes, that's true. The Pushkar fair brings together a large number of villagers from different parts of the state. Some come here to sell. Some come here to buy. Some come here on a pilgrimage. Still others come here just to enjoy the festivities. The days are filled with fun and activity. The evenings are filled with music and dance. Come dusk, and the rich strains of haunting music are carried across the desert sands as the merrymaking continues deep into the night. The profusion of colours that run riot in the desert sands, the glee and the contagious enthusiasm of the village folk are a unique experience for every visitor. After bathing at the lake, people proceed to pay homage to the creator of the Universe, Lord Brahma, at the Brahma Temple. Most pilgrims perform the oblations at the Jyeshtha Pushkar while some opt to visit all the three Pushkar and this is called the Panch-Kosi-Parikrama. Many pilgrims visit all the shrines at Pushkar in seven days and this is called the Chaubis-Kosi-Parikrama. It is customary to float lighted earthen lamps after placing them on 'Pattals' (plates made of leaves) on the waters of the lake. This creates a spectacular view in the evening when the sacred lake takes on a mystical tint sprinkled with twinkling spots of light. 'Aarti' is offered at the lake in the morning and evening. In conjunction with the religious fair, a cattle fair is also organized in the month of Kartik at Pushkar Cattle-breeders bring a large number of cattle of various popular breeds such as Nagauri, Haryanvi, Mewati, Kankrej etc. to the fair to be sold to the rural folk who appreciate well-bred animals. The cattle are decorated by their owners during Pushkar fair and also participate in the races.